AIRPORT governing body AENA has agreed to take care of feral cats living in various terminals in response to a complaint by Valencian regional party Compromís about a feeding ban. MP Carles Mulet demanded the PP national government overturn the prohibition, which had been applied at Madrid’s Adolfo Suárez-Barajas airport, saying it was cruel to the wild cats who live near the runways, car parks and on the streets outside the terminal. AENA has agreed to work with animal shelters and arrange for the cats to be rounded up and sterilised before being taken to rescue centres. Until now, since the ban on feeding feral cats was introduced in January, members of the public sector workers’ union CSI·F had been ignoring threats of disciplinary action and continuing to provide food for the feline colonies. They said not doing so was ‘animal cruelty’. European norms dictate that any wildlife in and around airports needs to be protected, but should be ‘managed’ properly as they can create a serious risk to airlines. The International Aviation Organisation (OACI) identified over 97,000 incidents involving wildlife in worldwide airports between the years of 2008 and 2015, and said they should not be fed on site. AENA says the ban only applies to ‘uncontrolled’ feeding by passengers, and says it is in close cooperation with animal shelters to ensure the feral cats at Spain’s airports are properly cared for. It will pay for them to be spayed or neutered, vaccinated and de-flead, and they will be placed in shelters, an AENA spokesperson said. Many of these feral cats will probably stay in the shelters for life, since they are difficult to domesticate unless they are very young and find it hard to adapt to living in human homes. 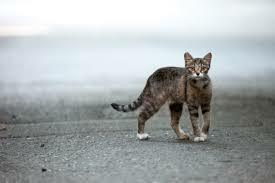 Several towns in Spain now have sterilisation programmes in place, where cats are caught, neutered and then put back in their street colonies, and give permits to volunteers who feed them regularly. Young kittens already weaned, or any that are thought to have been domestic cats abandoned by their owners, are taken to local shelters, but those who have grown up in the wild are left in the environment they are used to. Town councils recognise that their feral cat colonies are in fact an asset, since they keep the vermin population down.